Joan Burton said she hoped the Troika could comeback to Ireland on their holidays after the bailout programme is completed. 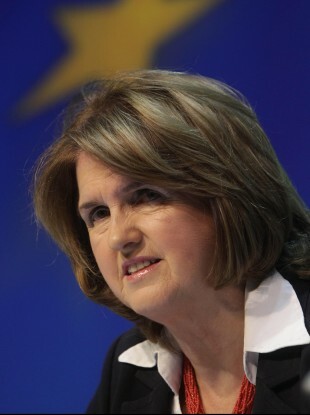 JOAN BURTON HAS said she is “absolutely confident” that Ireland can emerge from its current bailout and return to lending markets despite weekend reports that she believed the possibility of a second bailout could not be ruled out. The Social Protection Minister was quoted in the Sunday Independent as saying it was impossible to predict what would happen in the eurozone over the next 18 months. The report indicated that she was not ruling out the possibility of a second bailout. The issue has been raised in recent days following comments from a senior figure at Citigroup chief economist who said that Ireland should negotiate a “standby second bailout”. Finance Minister Michael Noonan dismissed such talk as “ludicrous”. “What I said [in the Sunday Independent interview] was if the eurozone can bring financial resources together, I am absolutely certain that the eurozone can resolve and overcome the doubts that the markets have. “I’m optimistic that it can happen and hopeful that it will happen… then Ireland will be in a very strong position to exit the bailout in a very orderly fashion,” she said. “Ireland is performing requirements of current agreement with the Troika,” Burton insisted but acknowledged that the ”eurozone difficulties pose difficulties for Ireland”. Burton added that said she was hopeful that the Troika – the European Commission, European Central Bank, and the International Monetary Fund – could comeback to Ireland for their holidays but admitted that was “a little bit off”. Email “Burton insists: 'Nobody is talking about a second bailout'”. Feedback on “Burton insists: 'Nobody is talking about a second bailout'”.